Classes today.....connecting to the earth, feeling grounded and secure. Do you ever get up in the morning and feel scattered, not quite together? You need to take a few moments, breathe, and allow yourself a few moments to ground. My favorite way to ground or feel connected.......bare feet, strong stance (mountain post), eyes closed, 10 breaths. It works. It is that primal need in all of us, to feel secure and stable, to know in our hearts that there is a connection with something greater, a connection to every living thing. Another great way to ground or earth......bare feet on grass or ground.....ten minutes, try it. All of this grounding, of feeling secure.......root chakra.....and we worked on finding that balance of root chakra energy today. What can I tell you, right now.......I feel extremely secure, connected and grounded. reading the comics, a nice long nap, making pumpkin muffins.......it has been a day of bliss. I love these days when you don't do much of anything, yet get a great deal done. Only a couple of days left in September.......October will be a busy month for us, gigs, travel, and doctor visits. I smelled wood smoke in the air tonight, I think one of the neighbors has a fire in the fireplace. I made an apple tart, with apples from our tree......so nice to walk out to the tree and pick. There is a hot cup of ginger that awaits me, Calliou is pacing back and forth between the office and the great room......he wants Rick and me in one space. Wishing you all a peaceful sleep tonight, wishing you a Monday that is full of giggles and hugs. Have you ever reached a goal and then........well, you just can't believe it. We finished our cd today, there is a little tweak to be done by the producer tonight and then tomorrow.......on its way to pressing. fatigue, and a difference of opinions can make us all a little testy.......I am glad to announce no blood has been shed. I still can't believe it is done and I can't wait until I can hold one in my hands. This all ties in with what I wrote about last night......use your talents. We may not be the best singing birds in the forest, but we're singing anyway.......no silence for us. Tomorrow night, we'll celebrate.......including a gratitude ceremony. It has been a long time coming, and it sure didn't come the way I had dreamed of recording a cd earlier in my life.......but it's here now, at the time it should be.....the way it should be. Rick and I are exhausted tonight.......but very very happy. Wishing you all a peaceful Sunday and to remind you......dreams can come true.....with time and lots of work. and in varying degrees......but we all have talent. I think we have been sold a bill of goods, if our talent is not the best, or the most unique......then it isn't any good. I love the parable about hiding your light under a bushel basket, our lights were meant to shine......let them shine. We were meant to use our talents, use them. music, teaching, being a good friend, being a good listener, telling jokes, sewing, fishing.....the list is endless......use your talents. It has been a good twenty-four hours, been in touch with friends, rested and taught two awesome classes today. Our cd is done. I thought this was an appropriate quote to share with you all tonight......I think it is a great truth. The takers may eat better, but the givers sleep better." Our friend Charlie ( who passed away a few years ago) use to say this often, and he always made a point of calling Rick and me, Givers........I took that as a wonderful compliment. they give until there is nothing left to give. They give love to the lovable and the unlovable. I think most of us, are givers and takers to some extent......that is just our human nature.....but there are the two extremes.....and in the extreme, I had much rather be a giver than a taker. Givers and takers, I choose to believe most of us give more than we take.......I hope we all sleep well tonight. I read the following quote several months ago, lost it and found it yesterday. There is much wisdom in it's words......I think we should all feed our "hungers". I pray that we all achieve our fulfillment. First day of autumn........strange, but you could feel the change in the air, see the change in the light......and after yesterday's rains, the crispness of clear blue skies was enchanting. A few humming birds still feeding, but the butterflies seem to be in frenzy, and everywhere you look there is evidence of squirrels nesting. I love it when the energy of nature demands that we humans notice our surroundings. There are surprises of color appearing in the trees now and this morning when we walked, a chill in the air. Fall has decided to grace us with her presence, and it is welcomed. Friends came over this afternoon, a shrimp boil soon began and the rest of the evening was spent in good company with good food. A great way to start the season. A wonderful way to end a week, a glorious way to begin one...... My energy is back, and I am ready to teach, to rehearse for our next show........ready to reclaim my life once again. Blessings to all of you this coming week........may you laugh out loud every day.......may you savor many moments and hug a loved one. Today I had the urge to nest......it might have been the rain, the cooler temperatures, the fact that this is the first day of energy since my treatment......but since tomorrow is the first day of fall.......I decorated. Pumpkins, harvest table cloth, a couple of witches and black cats........and I bought a pumpkin cookie cutter and Halloween sugar sprinkles so that Jordan and I can make cookies. Tonight, I have sat and read.......I love to read, almost anything......magazines, books, newspapers. Reading has been one of my favorite hobbies since I was a child. Reading took me to places I could only dream about, introduced me to exotic people, foods, and cultures. We always have an abundance of books, this week I finally cleaned the bookshelves and we donated a big box to Goodwill. Next will be a box of magazines to the Senior Center.......oh yeah, those bookshelves, only the ones in the great room, there are still four more floor to ceiling ones to go. Nesting, maybe it has to more to do with the fact that cooler weather is coming, and our bodies and brains know we will spend more time in our homes.......thus the need to make it cozy. What ever, I also bought a new comforter for our bed......now if I could just find the energy to paint some walls. I have learned this about my energy levels, don't push, don't overdo.......enjoy it when it's there, rest when it's not. I think that I am resting more than doing......maybe that is some of the nesting urge too. Wishing you a beautiful first day of fall tomorrow.......hope you get outside, enjoy fresh air and good company, eat a crisp juicy apple, buy a pumpkin! Do some nesting. I love the transition of the seasons......summer to fall is my favorite. 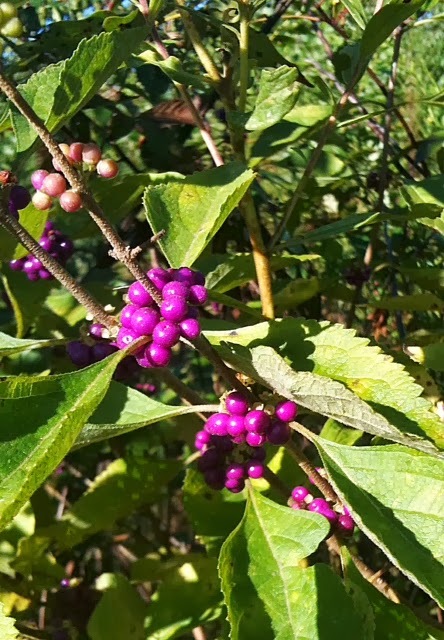 When I see the purple beauty berries, I know that fall in Alabama is just around the corner......even though it might be eighty degrees. Gentle rain falls on the tin roof tonight, Calliou is by my side.......all is right with the world. Transition of seasons occurs on many levels.......there is the actual change of seasons but there is also a change in the seasons of life. I am not in my winter, but I figure I am somewhere in my fall. Even in yoga, there is a season of sorts.......when you are young and full of energy that is the time to develop your practice, as the years go by you build your asanas, strength and stamina, then as you mature you concentrate on breath and a daily practice that suits your body.....and finally, in the winter of your life, the breath and meditation, you have finally learned to sit in silence and be present. the Delta blues, and southern gospel, and maybe these days, football fever. Fall doesn't shimmer with the range of hues here as it does in the north and east, but we have our own range of earthy color and clear blue skies........seventy degree days, fifty degree nights are perfect for me, throw in some rain and that is pretty much an Alabama fall. and a second tornado season. But, once in a blue moon.......we get snow and cold temperatures.....and I dance with joy. Whatever season is your favorite, whatever season of your life you are living.......enjoy where you are, remember, just like the weather, just like the seasons........transitions take place daily in each of our lives. Twenty months ago today, I started my treatments........it seems like yesterday. I am stable. That is good news......numbers are not dropping. We had a code today, not in the fusion room, but our nurses and doctor responded.........it was a little surreal, I don't think any of us took a full breath until we knew the patient that coded was stable. Those green chairs, those drips, those codes.......all reminders of how fragile and fleeting life is. My chair buddy Lewis came by and spent some time with me, his visits make the hours go by so much faster. Though today, it seemed time was very slow indeed. I am exhausted tonight.......it's interesting, same mix going in each time, but my body reacts differently each time. I can barely walk tonight. I have slept most of this evening, the bed is calling my name as I type this blog. Wishing you all, peaceful rest and the sweetest of dreams. My mom always called me a dreamer.......I didn't think that was a bad thing. I think dreams are the fuel that that feed our ambitions. I can't imagine not dreaming, not longing, not wishing........When I think about my dreams, I think of the song that Garth Brooks did a few years ago, Unanswered Prayers, written by Brooks, Pat Alger and Larry Bastian. The song talks about how unanswered prayers are sometimes really answered in a different way. I think most my dreams have come true, but not in the way that I imagined or hoped that they would. I didn't think that we would be in our 60's by the time it actually took place. I hope that if there are any of you with dreams that haven't come true, you are not giving up. The path may change, the dream might not be as you first dreamed it.......but I believe if you hold on to your dreams, a version of sorts will happen. Time and time again, I have spoke of Vision Boards......for years, my vision boards have always echoed my travel and music dreams and others as well.......it is astounding as I look back how many variations of those dreams have come true. Don't give up on your dreams, you might have to accept a different version or variation but if you pursue, if you put in the work, and the time........dreams come true. You'll get to see and hear our cd soon. Some nights, the words won't come, but I find comfort and wisdom in other's words and thoughts. It has been a busy day, our friend Ashley came over and shot pictures all afternoon for our CD cover. She is an awesome artist with a camera and there are so many to choose from. This one was taken at the old farm house down by our barn. Don't you love black and white photos? Back to the studio first thing in the morning, last song to be recorded........then mixing, choosing photo, liner notes.......it has been and continues to be an interesting journey. This is treatment week, energy is starting to lag a wee bit. Wishing you all a brand new week filled with people you love, good news, and the opportunity to laugh out loud each day. The skies were so blue today, I thought I was out west. I brought the yoga mats home from work and washed them, cleaned house, did grocery shopping......just an ordinary day. I happen to love ordinary days. These are the days that keep us sane, that build our strength, and that make us appreciate extraordinary ones. Calliou is pacing back and forth between the office and the great room tonight........it drives him crazy when Rick and I are not in the same room........he is a true herd dog. His day has been rather ordinary too, chasing squirrels, nipping anyone who walks by, allowing me to pet him. He is arrogant, high maintenance and unbelievably loving.......never had a dog quite like him. ways we choose to spend our past times. If your day has been ordinary, count your blessings.......if it has been extraordinary, count them twice. And if it has been difficult......know, this too shall pass. May your Sunday bring peace, joy and rest. 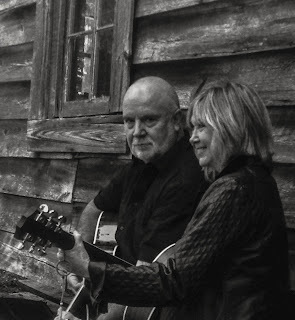 Still working hard on the cd......almost done.......it is grueling, painstaking.......fun and a labor of love. We will do photographs this weekend, one more song to sing.........and then the mixing......it's been on my bucket list a very very long time. I have never really written down a list......but in my heart, there are things that I keep there.....that I want to experience, to do before I leave this place. I think we all have those things, we long to do.........one of my biggies......Christmas in Prague.......why, I don't know, it just has been a longing, a yearning . This year's vision board is going to be a physical manifestation of those desires........you all know how I feel/believe in my vision boards. Maybe we should all do our bucket lists as a vision board.......it could be a group project.....it could be a group study. Bucket lists........wishes, hopes, dreams.......whether you write yours down, store it in your heart or create a vision board it is important to express what you want. If you haven't acknowledged your list, think about it, and don't be afraid to dream/hope BIG. "you get what you think about it, whether you want it or not." -Wayne Dyer. New faces in classes today......some do not want to come, they are made to come because it is part of their treatment plan......not the best way to introduce someone to yoga. Many came thinking it was an exercise class.....wrong, maybe in other class rooms, but mine is different. Sitting and breathing for five minutes can seem like hell when you don't want to be there......and then there are the asanas (poses) and more breathing....and then relaxation (and more breathing) Different reactions.......some loved it.....some got out as fast as they could. that it stands for.......but I try to make it a most wonderful experience, in a peaceful setting, in a room full of loving energy. I am drained, lots of energy expended and much more love. And honestly, most end up loving it because it is that place of calm in what can often be a chaotic and drama filled world. It is starting to rain and that is good........it has been hot, dry and dusty.....cooler weather coming and I welcome it. Sleep is greatly anticipated tonight. I read this quote, and then I read it again......it struck a nerve. unseen. In the past few years I have worked hard to change that trait......I want to connect, I want to see people......I want to acknowledge their existence......I want to see a person's value as a human, as part of this universe......and I want them to recognize mine as well. Looking over, around or through.......never again do I want to be guilty of that......I want to see the people I look at. Our summer was cool and rainy, September is hot and dry........interesting weather. This flower pot was full of purple monkey faces, then two pink ones just appeared......magic! 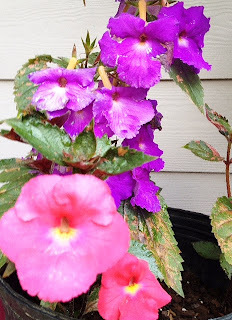 Our flowers have been at their grandest this year, blooms are big, colors saturated, and they just keep on producing. I know in a few weeks they will disappear......and I will miss them. But, I am ready for fall.......maybe. Transition.......it's one of those weeks where I will spend most days saying goodbye to students. It's great that they are leaving the program, that they are going forward to live the life they were born to live.......but it is difficult for me, always saying goodbye. There are so many now, I think of them, I see their faces.........and I hope, I pray that all is well.....that they are safe, and happy and peaceful....that life is treating them kind. Often I wake up in the middle of the night and I see their faces......I might not remember their names, but I pray for their well being, their safety and always......their happiness. a strange combination of words.....goodbye, it sounds so final and for my circumstance.......I hope it is......that my students never have to come back because of their addictions. There will be new faces soon, new students to teach.......and then .........more goodbyes......the never ending circle of my life. It has been a hectic weekend........we were in south Alabama, visiting with friends, helping with an Alzheimer's walk and playing a gig last night. Because our air quality has not been good, and the humidity has been very high I did not walk the walk yesterday. I was sitting at a picnic table as the walkers were gathering at the starting line when a beautiful older woman walked by me and smiled, she then came to me, hugged me and told me that even after she was gone, she would still be with me, she would watch over me. I felt peace and incredible love as this lady hugged me. She was an Alzheimer's patient, but for that moment the clarity of her thoughts, words and the look in her eyes was breath taking. That is not the first random hug that I have received in my life..........once a small child around 3 or 4 years old, broke away from his parents as I entered a store in Mississippi, ran to me with his arms outstretched, hugging me so tightly it took my breath.......he screamed and cried as his parents pried him from my arms. Once again, as he hugged me.......I felt peace and love. It has happened so many times, in strange places, among strangers........I am not sure why......but I do know, I feel as though I have been in the presence of extraordinary beings each time it has happened. Some might say all these random hugs were just coincidental, but I think not. I think those hugs have come into my life when I needed them the most, as reminders that I am loved and watched over. Each time it happens, I feel the peace, the love and great joy.........as though the universe was sending me a gift. So tonight, my prayers, my wish for all of you........random hugs.........I hope they come when you least expect them......when you need them the most.......random hugs.....don't take them for granted. life is good and I am tired. It's our only gig for September, because we are still hard at work on our cd. I dreamed about Blackie Bear last night.......he was running across the back yard, ambled up the back steps, came through the doggie door and lay down on his favorite rug and grunted........I awoke from my dream and realized how much I miss him. We have had many dogs through the years, but Black was mine, at times I felt as though he was guardian. After I started my treatments, he never let me out of sight........I can't believe he's been gone almost a year. It is interesting the relationships that develop between dogs and their humans, the loyalty and love that dogs give.......I think about all the dogs that have lived with us, each of them had such distinct personalities.....some were comical, some were needy, some could do amazing things like opening the fence gates. We had a German Shepard that I swear could talk.......you just couldn't understand him. I had a dog named Flop that I think was probably a cat in disguise.......she weighed about three pounds, her favorite place to sleep.......on top of the back of the sofa or on top of my head in the bed. When my father died, I had a yellow lab mix named Gibson......the day after his memorial service the grief almost drowned me......as I lay across the bed and sobbed, she jumped up on the bed and licked away the tears. I don't think I would have made it that day without her. They are so often called "man's " best friend........they have been my best friend many times. I have thought about forgiveness the past couple of days........an old wound reopened this week, I thought that I had worked through the pain, that I had forgiven.......it was obvious I had not. Forgiveness is an incredible act of love, really unconditional love. I spent a couple of sleepless nights dealing with dredges from the past, the hurt, the anger, the pain......I prayed blessings for the person that I had allowed to cause this spiral and I came to face to face with how difficult true forgiveness can be. Honestly, I am somewhere in the middle.......working slowly towards breaking the chains and bonds that will set me free. I know in my heart I will reach the point where I can forgive and move on......but I kid you not.....this is hard stuff. Lessons like this are milestones, path changers and I have to persevere.....there have been moments when I ask myself, is it really worth it? Deep in my soul, I know that it is. Even sharing this with all of you tonight was painful, but it is important that we all know the value of forgiveness, that we understand how not forgiving can cripple and stifle our lives and our joy. it is short. I am ready to let it go and move on. Understanding that I can't truly love myself until I forgive was the light that beckoned to me in the darkness.......I hope my words make a difference in your lives tonight......maybe we could all share a moment of forgiveness and find our way home. Some days you need nothing........well maybe a little food and water. Today has been my nothing day.......walk with the dogs, enjoy the sunshine, take a nap, practiced for our gig Saturday, see a friend. It's not the kind of day that would go down in the record books, I probably won't remember it a month from now.........but it was just the day I needed. No drama, no stress.........nothing. Nothing days for some might be a waste of time........I would argue that. We all need them......those days you won't remember, when nothing good or bad happened.......the perfect day to recharge and renew. If nothing has not been on your calendar in a while.......make it happen......leave the day planner blank.....don't make any plans......just do what feels right. I thought about my day......it felt pretty good to tell myself I had a nothing day. It will be a while before I have another one, the next few days are slammed.....that is ok......that just makes nothing a whole lot sweeter when it does come around again. Nothing, should be a national holiday.......you know, "what'd you do today?"........"nothing." The planets must be aligning with another universe......it has been an interesting day at best. This morning was beautiful, cool and sunny, low humidity.......we took Calliou and Lady for a walk.......all was well. Coming up the side of the big hill as we normally do, the dogs were chasing rabbits, I was looking at the beauty berry bushes, muscadines that were ripening and just enjoying the morning. In front of the barn, the dogs buzzed by faster than greyhounds chasing that rabbit on a stick.........I had on a tank top......and I noticed yellow things on my right arm......within seconds, those "things" became yellow jackets and they were stinging the daylights out of my arm. Rick was trying to swat them off me......too late, they were on Rick also. We made it to the house, thinking we were safe.....wrong......on of those little beasts had crawled up Rick 's shirt, soon he was being stung again. All total, we carried about 10 or 12 stings between us. My arm has throbbed all day. This all shall pass.......the teacher is learning once more to practice what she teaches......and to trust that all will be well. If you have some spare good thoughts tonight, send them my way, I can use them. Woke up to pouring rain, thunder and lightening.......Calliou was not happy. I love rainy mornings, (not stormy ones) it was great to sit on the sofa and drink steaming black coffee while the rain poured. Then, we decided to move to the screen porch and listen to the rain on the tin roof.......heavenly. Sometimes it is good to observe........I have tried to do that much of today.......observe the weather, the feel of the air, sounds, colors.....observe people, how they look, move, talk.......it has been one of those days when I have not felt a part of my surroundings......I truly have felt like an observer.